Episode Four: Still in the hole. 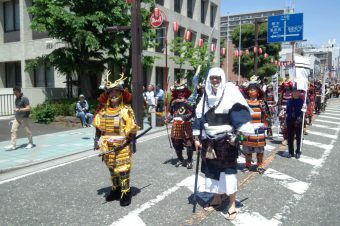 The next time I saw Masayo was three months after my disastrous confession, at the Yoshitsune Festival mentioned earlier. Needless to say, Masayo in resplendent armor was a huge hit with the crowds. Once again the photographers started snapping away crazily, even keeping pace with us as we marched in the parade. I even heard one say “Lord Yoshitsune is prettier than any of the Miss Kamakuras.” Running a Google search a few weeks after the parade, I saw a blog which had several pictures of Masayo and stated something about how apparently the City of Kamakura hired a professional model to represent Lord Yoshitsune. 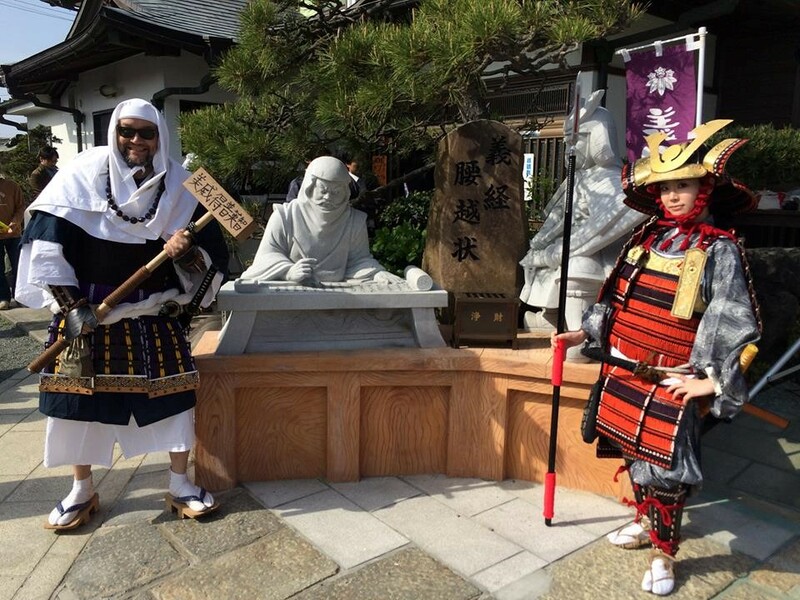 Here is a picture of Masayo and me taken at Manpukuji Temple on that occasion. 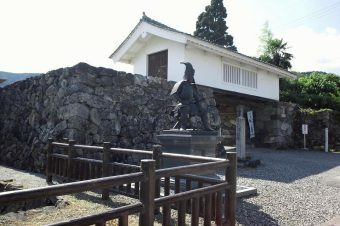 We are standing in front of the stone statues depicting Lord Yoshitsune dictating the Koshigoe Letter to Benkei. 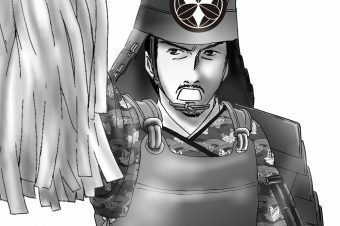 While the tragic saga of Lord Yoshitsune and Benkei, which unfolded at Koshigoe, will be the subject of a future column featuring Manpukuji, the important thing to keep in mind now is this: things didn’t end up well. Well, I guess even today things don’t turn out well for Benkei and Lord Yoshitsune at Manpukuji. Even though it was mid-April, as far as our relationship was concerned it was still deep winter. About a week after the Yoshitsune Festival, I received a phone call from Yohsuke. 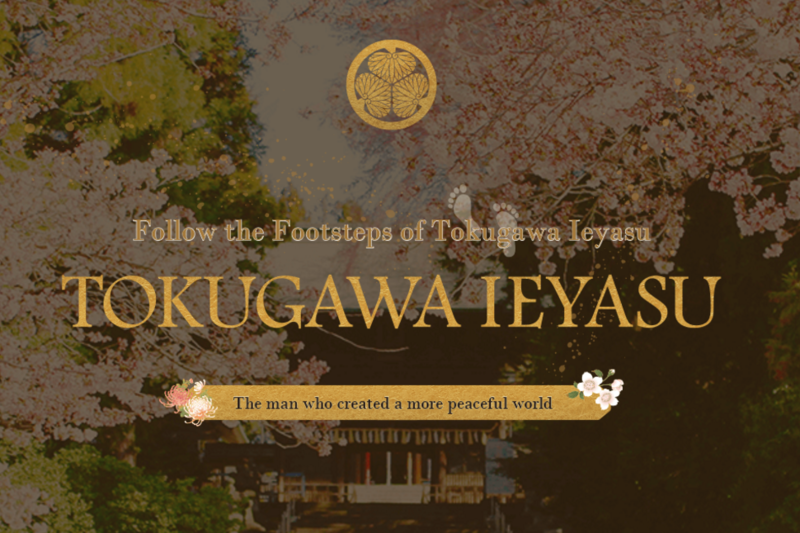 He was going to visit Tarui on May 3rd (smack dab in the middle of Golden Week) to view the annual Hikiyama Festival, and invited me to join him. 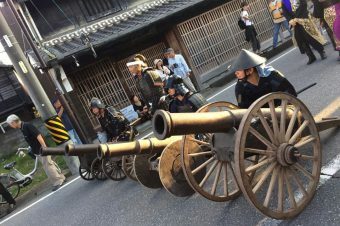 This festival is held from May 2 to May 5 every year, and features three hikiyama, or festival wagons, one each representing the West, East and Middle neighborhoods of Tarui. 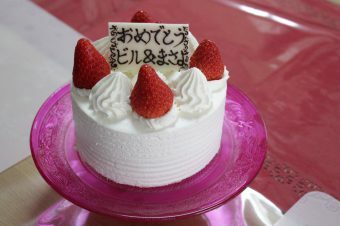 The three hikiyama are named Hanrinkaku, Hououzan and Shiunkaku, respectively. 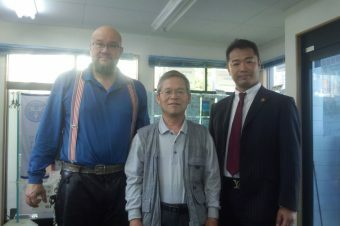 As there was nothing special going on up in the Kanto area to keep me here, I decided I would make the trip to Tarui. 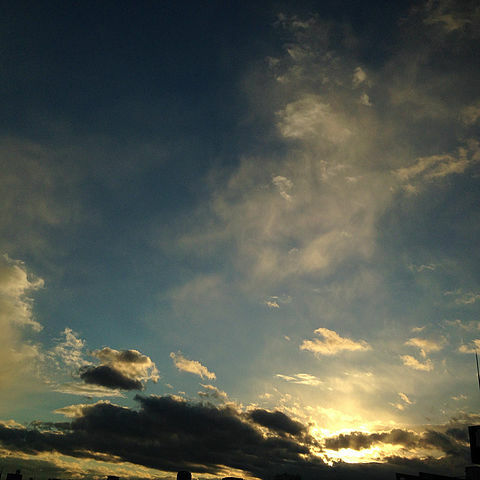 Since it was Golden Week, I planned to ride my motorcycle instead of driving my car and braving the miles long traffic jams on the Tomei Expressway. Taking the Bullet Train was out, as all of the reserved seats were sold out and the only way to ride would be to ride in the unreserved seating cars packed like sardines to 200%+ capacity. 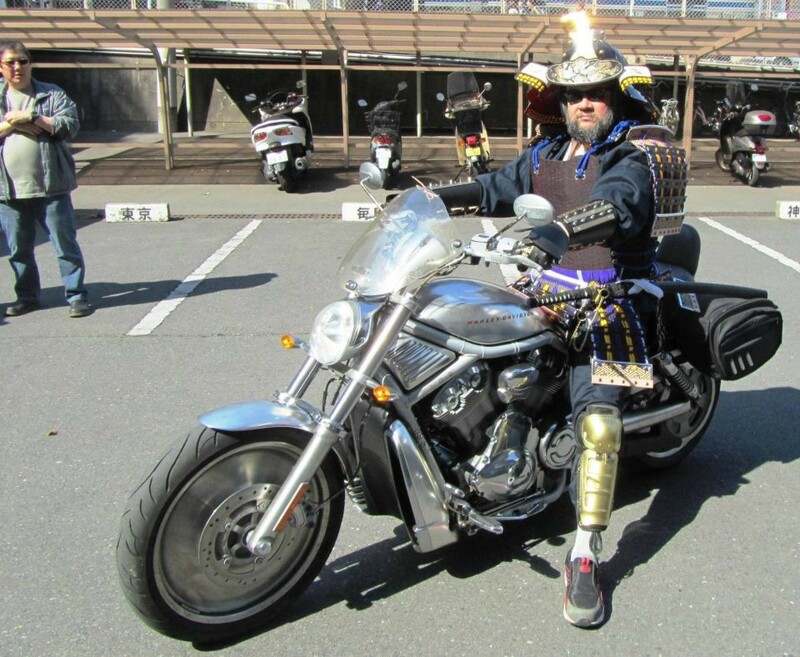 Back when this photo was taken, wearing my samurai armor I would ride my bike to/from events, appealing Kamakura’s inclusion as a UNESCO World Heritage Site, a dream which unfortunately failed to materialize. Yes, the samurai helmet is a converted JIS approved motorcycle helmet, and no, I didn’t wear this getup to ride to Tarui.